Jamie Scott comes from a long family history in the swimming pool industry. His experience and passion led him to create Group Works. As the owner, he takes a hands-on approach by personally directing every project—from concept through final construction. 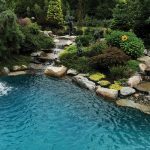 He also oversees the coordination of his pool builders, masons, landscapers, electricians, and other workers to ensure that the project is running smoothly. “Planning, listening to the homeowner’s desires, and setting expectations are the ingredients for a successful project,” he says. Group Works’ clients have been more than satisfied with their experiences; as proven by the fact that the company receives most of its projects through referrals. The focus of every design goes beyond the pool alone. By observing the entire setting, the surrounding elements are incorporated into the design. These factors include everything from the land’s topography to the home and surrounding architecture. Through this approach, Group Works produces backyard havens that blend with their surroundings. Group Works thinks of each project as having its own character, personality, and opportunities. Non-traditional materials are brought forward and considered. In addition to aesthetics, the team at Group Works focuses on hydraulics and engineering, which enables them to lower the after-construction cost. These unique designs often include environmentally-friendly systems as well, such as solar heating, ozonators, and variable-speed pumps. Jamie Scott puts a high priority on continued education and exchanging ideas with his peers. As a platinum member of ­Genesis 3 and a member of the Society of Watershape Designers, he gains in-depth knowledge and up-to-date techniques, which show in his work. Group Works recently received an award for Outstanding Pool & Recreational Project of the Year by the American Shotcrete Association, and was a winner of the 2011 Pinnacle Awards from Luxury Pools magazine.